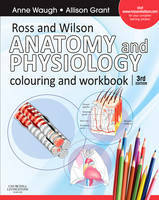 This popular workbook is based on the best-selling text “Ross and Wilson: Anatomy and Physiology in Health and Illness”, a favourite with an array of students including nurses, nursing students, students of the professions allied to medicine, paramedics, ambulance technicians and complementary therapists whose course includes study of anatomy and physiology. It has been written to appeal to the same audience and to be used in combination with the main text or with course notes or other anatomy and physiology textbooks. It complements different styles of learning and will assist the student by providing stimulating learning activities to facilitate and reinforce learning or revision.